Southern California is home to millions of miles of roads that lead to some of the most beautiful destinations in the world. It is also home to construction work, potholes, and heavy traffic that are infamous the world round. For tens of thousands of residents every year, this means auto glass cracks and chips. This is why PG Auto Glass, the leading mobile auto glass repair and replacement company in Los Angeles, is now offering a 10% discount to get drivers back on the road with a safe vehicle and auto glass that is good as new. Whether it is a flying pebble or a piece of debris that has fallen off the back of a truck, a cracked windshield can happen at any moment. For many drivers, this is a small problem that will not be given a second thought. It does not take much for these small problems to become a major inconvenience or even a dangerous situation. 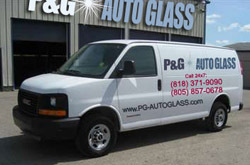 PG's auto glass replacement in Los Angeles has a fleet of vans and trucks to serve the greater Los Angeles area. Without repair or replacement, minor damage can lead to larger cracks that will hinder vision and make factory windshields unsafe to use. When it comes to smaller cracks or nicks, PG uses only the highest quality materials for their auto glass repair in Los Angeles. Their fleet of vehicles and experienced staff can visit drivers at work or even in the comfort of their own home to carry out a repair that can be done in as little as an hour. Emergency late night or weekend repairs are never a problem either. On top of their mobile auto glass repair, PG also specializes in mobile auto glass replacement with OE windshields. Unlike many other companies that opt for OEE aftermarket parts that are thinner and generally do not fit as well, these OE replacements are built to factory specifications and carried out on location. PG is not simply offering quality repairs by an experienced staff, they are thanking the community with their 10% discount to get them back on the road with a little more money in their pocket.